Unit 35A Lot 39. 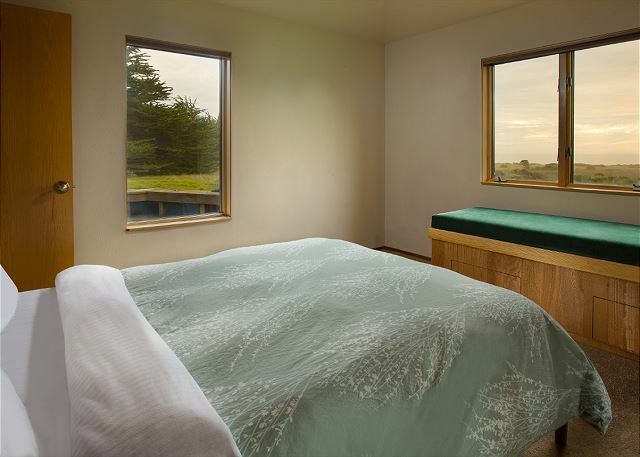 Toto House is a classic Sea Ranch home with panoramic views of the meadow, ocean and sky. 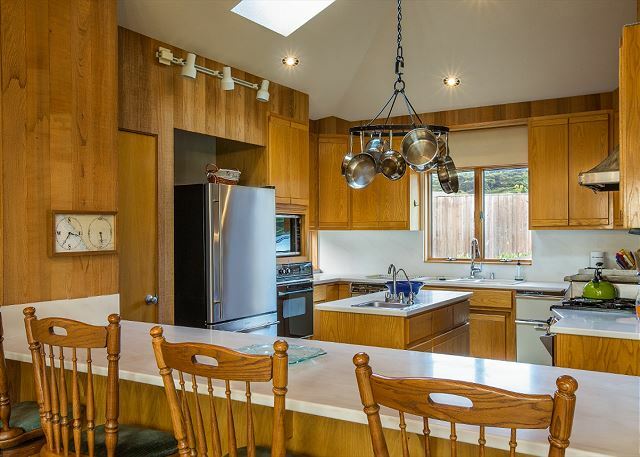 The house is situated on a quiet cul de sac, adjacent to one of The Sea Ranch’s famed Hedgerows, and offers the best in single level living. It is conveniently located 5 minutes south of Gualala where provisions, art galleries, and restaurants can be found. Designed by Steve Brodie, AIA, Toto House is a bright and comfortable 3 bedroom, two bath home. 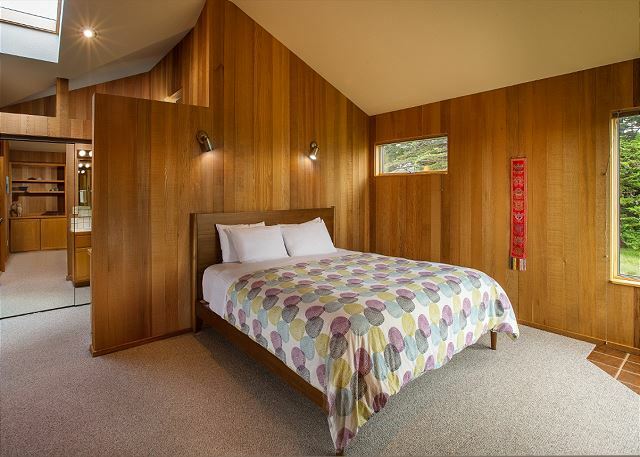 The home is perfectly suited for families with children or couples enjoying time away. At the heart of the single level floor plan are the kitchen, dining and living room with wood burning stove. Flowing from the shared spaces, the bedrooms are set at opposite wings of the home, allowing guests the space to retreat back to their rooms for relaxation. For cooking enthusiasts, Toto’s kitchen is well conceived, laid out, and appointed. Enjoy a glass of your favorite libation while preparing your meals and gazing upon the meadow, a family of deer, and the ocean beyond. The centerpiece of the kitchen is a commercial Wolf range, with four high output burners, a large griddle, and salamander. The stove burners require manual lighting with each use, which can invoke feelings of chemistry class and lighting a bunsen burner. While the oven on the Wolf is not available for use, there is a 24” inch wall oven for your baking and roasting needs. A microwave oven, toaster oven, dishwasher, coffee maker and electric tea kettle are also provided. The center island has a bar sink with a filtered water spout. The well conceived passive solar design takes advantage of the warm sun rays to maintain the warmth of the home. By midday the house is usually toasty and can be cooled by opening the deck door to the sea breeze. For cold days or late evenings there is a work horse of a wood burning stove - firewood is provided. Living with the radiant glow of a wood stove is part of the charm of a Sea Ranch vacation. For outdoor enthusiasts, the home is located close to hiking / running trails, swimming, tennis, golf, abalone dive sites, beaches, and an equestrian center. For those who enjoy the fauna of The Sea Ranch, the backyard meadow is home to foxes, deer, raccoons, jackrabbits, birds large and small, and the occasional skunk. Breaching whales can be seen from the living room/deck at the right times of year. 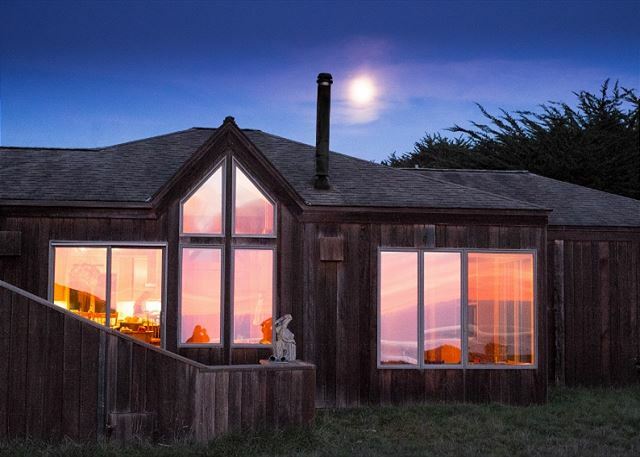 Relax, unwind and recharge in this classic Sea Ranch home. We have travelled to many places in the world, but this is definitely one of the most beautiful places I have stayed at! It's the kind of simple luxury, just very good architecture in the middle of incredible landscape. Nothing that bothers your eyes! Very calm and peaceful! You can watch the whales passing from the bed, the fox comes around every night. Just perfect! In addition, the house is very well equipped in every concern! Excellent kitchen! Erin H does not recommend this vacation rental. Loved Sea Ranch. The property had no kitchen towels and we were not warned that the oven was not working (brought food to cook in oven). The corners of the floors had cobwebs, there is a spill in the kids room carpet that could use a professional clean. Overall there was a wet dog smell in the kids room as well. The property and location was breathtaking and we had a good stay because of that! On behalf of the team I apologize for the troubles you experienced with the home. Please know feedback such as your helps us correct and improve the overall experience and we will be sure to address each issue you mentioned. I was very happy to read you were able to soak in the natural beauty that surrounds the home. Please let me know when your travels bring you back into the area, my direct line is. A total relaxation at the Toto House. Great ocean view when you wake up in the morning. Sipping coffee on the deck, reading a book, or walking on the trail near the ocean, it gave all of us a great short vacation we've never before experienced. Better dining ware would be great. The oven is not working, that limited one of the cooking option. The small fire stove is so outdated and difficult to lit. The wood is just too big to start fire with so little starter candle fire. Some old newspaper would help too. Other than that we had a great time. Dear Mr. Wang, Thank you for taking the time to complete a review on your recent stay at the Toto home. I appreciate all your great feedback and . I apologize for the oven, I'm curious if the oven you are speaking off is the Wolf Range or the standard oven? I'm sorry if the sign mentioning the Wolf Range was not operational. Additionally, I will make sure my team has the kindling and newspaper near the fire stove. We hope to have you as our guest again. Very nice house, beautiful view on the sea. 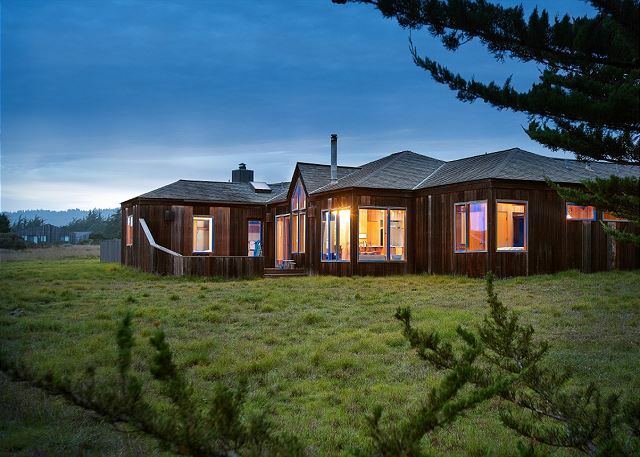 A great sea ranch experience that we are all eager to renew ! Sea Ranch had been recommended to us by friends from Santa Cruz. it took us a few years but finally, we made a reservation. Our rental, Toto, was very comfortable, well-located and in very good condition. We used the nearby beaches and hiking trails along the bluff. We also used the medium-sized pool and shopped in the local town and the Lodge gift-shop. All were positive experiences and we were sad to leave after our 3-night stay.